We have an intense kitchen helper. She loves pancakes…making and eating them. Together we follow a recipe from this standard, classic cook book. 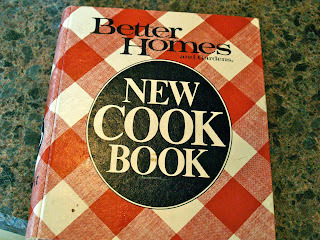 It gives simple, easy recipes and has taught me to cook through my twenties…and into my thirties. Page 88, pancakes. I have modified the recipe many times. But the listed buttermilk recipe is wonderful by itself. We usually substitute about a third of the flour with whole wheat flour, use egg whites instead of whole eggs, cut the oil by a third and add a dash of cinnamon and vanilla. This week we added two bananas and we always double or triple the recipe. 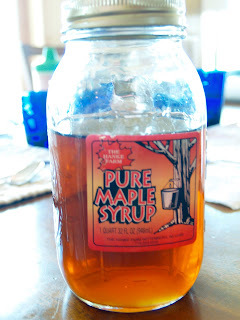 The leftover pancakes go in the fridge for a hot breakfast for the remainder of the week and into the freezer for a quick after church brunch item. Daddy likes chocolate chips on his pancakes and E knows that so she makes a few special pancakes for Daddy. Plus chocolate chips are fun to snitch. A little chocolate also stops a two year temper tantrum very quickly. We make bunny and duck pancakes too. Cousins Logan and Wyatt gave us these cut outs that they used for pancakes when they were little. E loves them. Top them off with some pure maple syrup or fresh fruit and you cannot go wrong. Pancakes create easy, affordable fun in the kitchen with Miss E.
The best part is my little helper is all smiles. Elizabeth is quite a chatty gal and has strong ideas of her own whether we are making pancakes, asking her to go to the bathroom, pick up her toys or get ready for bed. “Mommy, are you happy with me? There is no doubt, we have our work cut out for us with Miss E. But her zest and spirit bring smiles to our faces and her one liners bring chuckles under our breath as we try to keep a straight face! How precious! Your going to blink and she is going to be running out of the house with car keys. I love my pancake days…usually Saturdays:) And I don’t make from scratch. I am lazy I guess.